Maybe we can post here some pictures about the currently made tracks. I would like to see what everyone is working on. This is the track created for the example, previewed in map viewer. I love how just the example track looks amazing. Wow the track looks just amazing ! good work and forward to test it in alpha1 ! thanks to all the persons who work on this game !! Thats what i'm talking about! all respect goes to the MXB trackmakers! I´ve been trying to get this track in Map viewer for awhile now, and with the help of Geofanatec I could finally get the map.bat file to work right. Today I´ve been trying to get masks to work, and this is the result (Note that the textures are being made fast and aren't good at all). Nice little layout I like it. Keep up the work! Thanks to Barrington for the 1:1.25 scale heightmap (hopefully this scale works well or I will have some work to do haha). Why do you have to always to make us feel bad with how sick your tracks look Jason. Goddamnit I envy you. 2013 Sam Boyd stadium? 2014 son, what do you think we are working in the past? Come on haha. Object placement/importing is awesome in this vs. MXS (I know I know stop talking about it) because we can place everything in max. Also, everything is safe unless there is a edf2fbx converter I dont know about so no one can access any of the source files. Should help to kill ripping before it even starts. Ahhh. So happy to see an sx track. Hopefully you have it finished in time for the release. Loving it dude. That triple looks fun as hell. 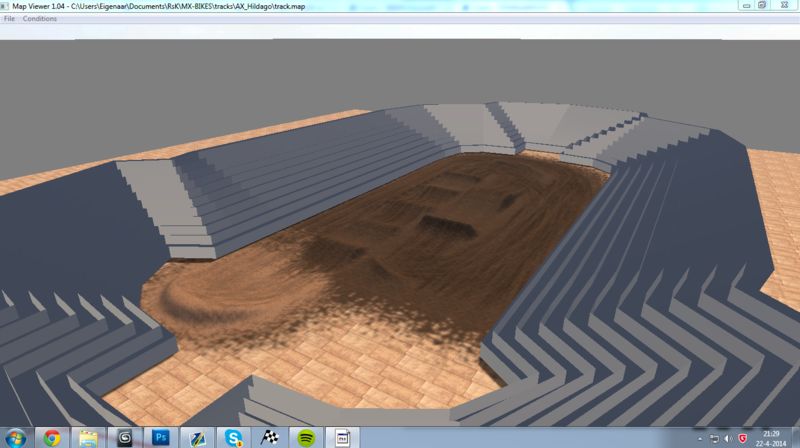 I made a quick stadium model for my AX track, I can't figure out how to get it on my track though. Thanks to bearded4glory I got it on my track properly. Also got some tuffblocks on my track.